1. An inhabitant of Jerusalem, and the maternal grandfather of Jehoiachin (II Kings xxiv. 8), probably identical with the son of Achbor, who was sent to conduct the offending prophet Urijah back from Egypt, and who entreated Jehoiachin not to "burn the roll" (Jer. xxvi. 22; xxxvi. 12, 25). 2. 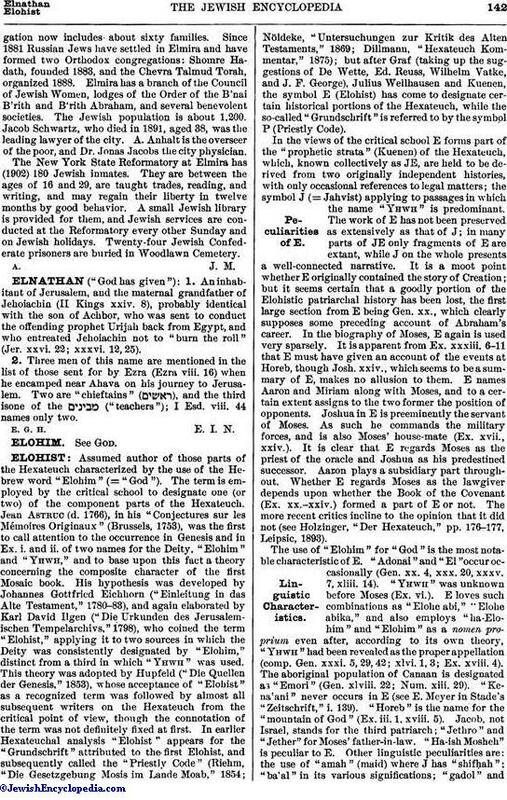 Three men of this name are mentioned in the list of those sent for by Ezra (Ezra viii. 16) when he encamped near Ahava on his journey to Jerusalem. Two are "chieftains" ( ), and the third isone of the ("teachers"); I Esd. viii. 44 names only two.